Chrysler’s large sedan has entered its 14th year of production in 2018 without a major redesign. That’s an eternity in the automotive industry, in which new models are introduced in rapid succession. And yet, the 300 soldiers on thanks to numerous improvements brought on over the years, including a partially redesigned body in 2011, and another cosmetic refresh in 2015. The cockpit has also been redesigned during that period, benefitting from higher-quality materials and improved fit and finish. The 2018 model offers a choice of two powertrains, including a 3.6-litre V6 that develops 292 horsepower and 260 pound-feet of torque—or 300 hp and 264 lb.-ft. in the 300S version—as well as a 5.7-litre V8 that produces 363 horsepower and 394 pound-feet. In both cases, power is sent to the rear wheels by an eight-speed automatic transmission. V8 engines are now rare in passenger cars today, but Chrysler’s sedan—and its Dodge Charger cousin—can still be equipped with one. To confront the harsh Canadian winters, an all-wheel drivetrain is available in many trim levels, but can only be matched with the V6 engine. Obviously, fuel consumption is more reasonable with the latter, with city/highway ratings of 12.4/7.8 L/100 km. In the full-size sedan category, the Chevrolet Impala, Nissan Maxima and Toyota Avalon can do better. With the HEMI V8 engine, fuel consumption rises to 14.7/9.4 L/100 km. The sedan’s lineup has been slightly revised for 2018. The Touring, Touring-L and 300S trims remain, while the Limited version replaces last year’s 300C, and the 300C Platinum simply becomes the 300C. The 2018 Chrysler 300 includes standard features such as dual-zone climate control, a 12-way power driver’s seat, 17-inch wheels, an intelligent key and a Uconnect infotainment system with seven-inch touchscreen that integrates Apple CarPlay and Android Auto. Climbing up the trim levels, or choosing among the numerous option packages, we can equip the 300 with heated and ventilated front seats, heated rear seats and steering wheel, Nappa leather upholstery, a power front passenger seat, a panoramic sunroof, 20-inch wheels, HID headlights, front and rear park sonar, a Uconnect system with 8.4-inch touchscreen and navigation as well as a BeatsAudio or Harman/Kardon sound system. On the safety front, the sedan can also boast blind spot monitoring with rear cross-traffic alert, adaptive cruise control, automatic high beams, precollision warning with autonomous emergency braking as well as lane-departure warning and prevention. 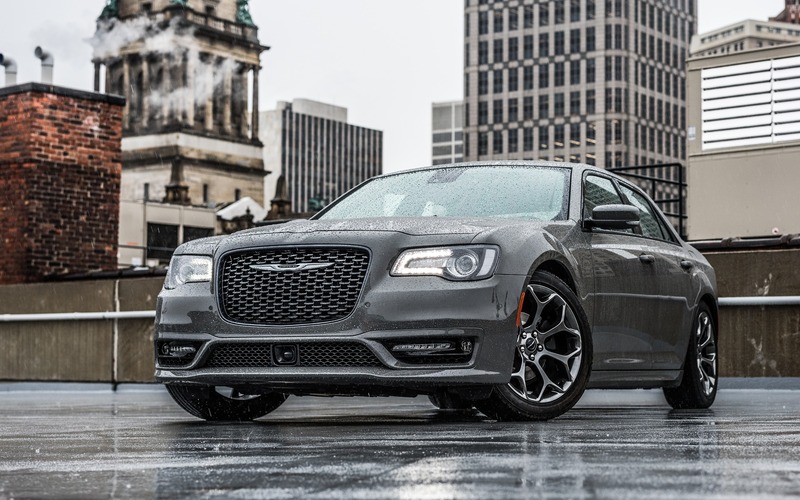 The 2018 Chrysler 300 retails from $41,245 before freight and delivery charges, while the fully-loaded, most luxurious version goes for $56,225.